Autoglanz Blood Tonic is an advanced, pH neutral reactive gel based formula that specificity targets only the outer rusty shell of bonded ferrous particles. Bleeding Reactive Iron Fallout Remover, the hottest and most visually pleasing product to grace the detailing community in recent years. 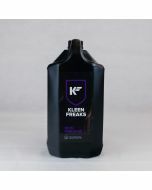 Ferrous contamination causes a major problem in the world of detailing, tiny particles of iron fallout (commonly seen from industrial/rail fallout and brake dust) are deposited on your vehicle and become embedded into the delicate surface. These small iron particles become bonded to the surface, slowly corroding and can prove difficult to remove with normal cleaning, this has a visual effect if left to build up and can cause damage to the surface itself in extreme cases. AutoGlanz Blood Tonic is an advanced, reactive gel based formula that specifically targets only the outer rusty shell of bonded ferrous particles and works at safely dissolving the contaminant to release it from the surface so it can be swilled away with regular wash routine in a safe manner. Blood Tonic is suitable for use on all exterior surfaces including, paintwork, aluminium, stainless steel, magnesium, chrome, anodized finishes, glass, plastic trims and even rubber. 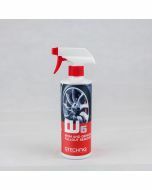 When used in its neat form, Blood Tonic’s added blend of degreasing agents also helps to loosen everyday grime making it a brilliant single stage wheel cleaner. Blood Tonic also has the added benefit of being LSP/wax safe, when diluted 3:1 with water, the mixture will go a long way towards keeping the build up of fallout at bay, if used on a more regular bases, this 3:1 dilution makes Blood Tonic one of the most cost effective fallout removers on the market today. Traditionally a bleeding reactive iron fallout remover tends to naturally have a rotten smell due to the nature of the chemical formula, we have added a cranberry fragrance to Blood Tonic which helps mask the naturally occurring odour and improve your user experience.